Political context Virtually all observers of Ethiopian history and politics agree that current political events cannot be isolated from past history. The multiplicity of the Ethiopian people, and its links to ancient history and culture are reflected in traditions still very much alive today. However, Ethiopia today is said to be a "new" Ethiopia in the making. After decades of resistance and war against different totalitarian regimes within, a new model of state governance is being implemented. According to the authorities an ethnic federal state, with ethnically defined regions and democratic standards, has been introduced in the country. During the 1990s, many observers viewed Ethiopia's experiment in government as a bold attempt at African nation building, while others worried about what will become of the traditional "Ethiopian entity" after ethnic division. To attempt to describe the ongoing political changes in Ethiopia in an introductory paragraph would be overly ambitious. However, a key concern of this study is to relate the professionalism of Ethiopia's news media to human rights and democracy in the nation—to participation and pluralism. The redefinition of the Ethiopian state on a new basis is underway, but the very foundation of that project remains controversial. In conducting our research, we have received the general impression that history is being repeated in Ethiopia. One could still say that a top-down authority is imposed on the people, this time draped in the ideological rhetoric of democracy, and again with external support, now from the West. After decades of failed political experiments, several key issues in Ethiopian politics remain to be solved. In many situations it would be gravely misleading to analyze African democracy in terms of Western concepts. Ethiopia might and should develop democratic institutions well suited for its own society, and such institutions may differ from Western models. However, there are also certain principles fundamental to democratic modes of governance which are universal. These include open and equal opportunity for all to participate in politics, and freedom of speech and organization. Independent of local history and cultural context, these standards must be respected in a democratic society. Professionalism in a country's media allows for a constructive use of the freedom of speech, one that offers truthful, useful criticism of a country's institutions. Ethiopia has chosen to enact a specific press bill, rather than to rely on the common law approach used in the United States and other Western democracies. These provisions would seem to create a liberal press environment. However, the absence of a free media tradition in Ethiopia has resulted in lack of adequate provisions for developing independent, professional journalism. Also lacking is a professional board or other mechanism to determine whether press content fits the press bill's criteria for press responsibility and for the taking of lawful measures. Thus most press offenses are considered by authorities as criminal, and not civic in nature. To develop media as a viable source of information is to enable and support democracy in Ethiopia by strengthening human rights and democratic institutions. The promotion of human rights depends, among other factors, on the active involvement of the media. On the other hand, the effective operation of the media depends on a government that respects human rights and the freedom "to seek, receive, and impart information and ideas through media and regardless of frontiers" (The Press Freedom Bill). The freedom of expression may be ushered in and cultivated through professional, independent journalism. Polarization Public debate in Ethiopia seems polarized to a first time visitor. Events and statements are easily interpreted to fit into the patterns of old conflict, and few people seem willing to engage in constructive dialogue with their adversaries. One also notices deep mistrust regarding an opponent's motives. Ethiopians who reflect on their own traditions often say "we sit on our own chairs and do not meet in the middle." Regarding the media, this means that the independent press easily interprets all the stories in the government papers as propaganda, while the government media looks at the independent press with great skepticism, to the point of calling it an enemy of the people. One of the causes for this polarization is the absence of a tradition of dialogue among adversaries. Some Western nations have long venerated the idea of discussion between competing parties, while physical force or other forms of intimidation have been practiced and encouraged in Ethiopia. The country's democratic movement during the 1990s has so far been neither strong enough, nor has it lasted long enough to alleviate some peoples' fears that it will backfire. Another reason for polarization is ethnic practices. The country contains more than 80 smaller or larger ethnic groups with different languages that have played an important role in defining ethnicity in Ethiopia. The former regime called itself Marxist, but the fact that certain ethnic groups dominated it was to many Ethiopians far more important. And today the same people are far more preoccupied with the fact that the present government has its power base related to ethnicity, than that it calls itself democratic. It is our impression that the Ethiopians have developed a sophisticated ability to interpret anything that emerges from the government quarters. Their basic assumption is that what they hear is not true. On the other hand, the polarization of the Ethiopian debate results in an added sense of personal engagement on the part of journalists, which is of vital importance to the Ethiopian press. Because of the tense ethnic situation as well as the government's softness on the enforcement of human rights, journalists take personal risks in pursuing certain stories. These risks add a dimension of reality to the debate and inspire journalists to a true devotion to their jobs. The challenge to the press is to communicate this engagement and devotion through stories and articles of high journalistic quality. When political distrust and allegations are part of an ongoing process, one should be wary of taking any absolute stand for either side. Ethiopian political positions have become so entrenched, so defensive, that political arguments have to a large degree lost their value. Since the adversary is suspected of hidden motives, every group believes it is the only truly democratic one. Groups practice a total and unyielding criticism of each other, a moral exclusiveness, which does not allow them to expect anything but disruption and destruction from the other groups. Consequently political positions become self assertive and absolute: every new revelation of the adversary, every new suspicion instantly adds credibility to one's own position. To get the political process on track towards an incorporating, broad based, participatory democracy, a constructive dialogue between the different actors must be established. The Ethiopian political environment seems to lack tradition for agreeing to disagree. Disagreement seems often to result in enmity and polarization. An important step towards broad and mutual participation in the country's decisions will thus be to nurture a less-biased, truth-searching media, one capable of bringing about dialogue between the different actors in the Ethiopian community. This dialogue should not seek consensus for its own sake, but in order to avoid polarization, which blocks communication and cements enmity. Dictators have been common throughout Ethiopian history. Whatever press existed during the reign of Emperor Haile Selassie I (1930-74) and the following dictatorship behaved, with a few exceptions, like willing mouthpieces for the rulers. Only during the 1990s have signs of a free and independent press emerged. During that decade a plethora of new magazines and papers appeared on Ethiopian stands. In a country with more than 80 languages, it is difficult to establish national newspapers and nationwide radio/TV programming. Traditionally a rather high percent of the urban population understand Amharic, and most newspapers, radio and TV programs are available in that language. Only a few programs in radio and television are produced in other major languages, such as Tigrinya and Oromiffa. Even though many newspapers are published in Ethiopia, journalism as many Western nations practice (or at least believe in practicing) it—as an independent, critical, theoretically objective enterprise—has never really developed, and only sporadically have high-profile Ethiopians objected to the country's lack of an independent "fourth estate." Western journalists learn early on that reporting must be separated from commentary, but Ethiopian journalists routinely conflate the two, to name just one example. Until the passage of the Press Freedom Bill in 1992, the printed press was limited. The first newspaper in Ethiopia and a few other publications emerged under Emperor Haile Selassie I. However, modern mass media was introduced in Ethiopia a century ago, during the reign of Menelik II (who ruled from 1889-1913). The first medium to be introduced was a weekly newspaper ( La Se-maine d'Ethiopie, 1890), published in French by a Franciscan missionary living in Harar. In 1905 the name of the publication changed to Le Semeur d'Ethiopie. The first Amharic newspaper was issued in 1895—a four page weekly newspaper named Aemero . The first issues were hand written. Between 1912 and 1915 weekly newspapers like Melekete Selam, Yetor Wore ("War News"), and many others emerged. For the most part, these print media were controlled by the country's government, subject to official censorship and string-pulling. In 1965 Berhanena Selam Printing Press, a modern, almost monopoly instituition run by the government, was established. The Printing Press played a role in the publication of two national weekly newspapers, Addis Zemen (New Era), in Amharic (1941) and its English counterpart the Ethiopian Herald, in 1943. These two served as the main official press organs of the state and as the main source of information for literate people. A military group called the Derg wrested power from Selassie in September 1974 and arrested him, citing his incompetence in domestic affairs (particularly in dealing with an early-1970s famine that ravaged parts of the country). Derg member Major Mengistu Haile Mariam established his own leadership within that organization in February 1977 via a shootout between his followers and those of his main rival, Tafari Banti, who died in the fighting; following this, Mengistu declared himself chairman and began his military rule over the country by 1977. During the 17 years of Mengistu's rule, the government-and party-owned publications Meskerem ("September"), Serto Ader ("Worker"), and the pre-Derg Yezareyitu Ethiopia ("Ethiopia Today") were published in addition to the previously mentioned Addis Zemen and the Ethiopian Herald . In October 1992, as previously mentioned, came the proclamation of the Press Freedom Bill by the Ethiopian Transitional Government. The document states in Paragraph 3 that "1. Freedom of the press is recognized and respected in Ethiopia. 2. Censorship of the press and any restriction of a similar nature are hereby prohibited." Part Three further guaranteed the right of access to information: "Any press and its agents shall, without prejudice to rights conformed by other laws, have the right to seek, obtain and report news and information from any government source of news and information." After the proclamation of the Press Freedom Bill, new, independent newspapers and magazines developed, especially in Addis Ababa. These offer the minority points of view often left out of government-owned publications, but suffer from inadequate fact-checking and occasional censorship, as well as the government's refusal to allow representatives from non-official papers at its press conferences. News agencies, often government-owned, were also introduced to the country during the previous century, including the Ethiopian News Agency (ENA), begun in 1942 as "Agenze Direczion" and renamed in 1968. Walta Information Service, a more recently established news agency, is associated with EPRDF, the party in power, and is housed in the same complex as Radio Fana. The Ethiopian publishing industry mushroomed after the Press Bill of 1992. Figures differ, but according to the Government, 385 publications were registered between October 1992 and July 1997, of which 265 were newspapers and 120 magazines. At any one time, there are probably about 20 different newspapers for sale in Addis Ababa. More than half of the total number of papers were closed down during the same five-year period, often because of limited resources. The "independent papers" are owned by private share companies (business.communities, political parties or just individual business entrepreneurs). Because of a very limited middle-class, the income on advertising is also very limited. The government papers are subsidized by government funds, and partly financed by advertisements and subscribers. Access to publications outside the capital is limited. Given Ethiopia's low literacy rate, and the relative high cost of newspapers, regular readership may be as low as one percent of the population. The Addis Ababa public consumes most of the country's newspapers (which, in total, number no more than 500,000 out of a population of 60 million, or less than one in a thousand). As for the demand side, illiteracy, weak economy and the near non-existence of infrastructure prevent newspapers from reaching a mass readership, especially in rural areas, where newspapers (as previously noted) cannot even be distributed. In this kind of situation, it is self-evident that radio and TV are important media. Radio is important because it is inexpensive and available for group listening. TV is important for the same reasons, and both broadcast mediums are especially useful because they don't require literacy. TV sets are scarce in the rural cities and almost absent in the villages and in the remote parts of the country. Radio sets are better distributed, but are still a luxury commodity for large segments of the Ethiopian population. Even batteries for the radio sets are far too expensive in areas defined as non-monetary communities. Broadcast media may be able to fill in some of the educational gaps created by illiteracy and language difference. Following the proclamation of the Press Bill, many private and party newspapers began to appear. In addition the Ethiopian Press agency now publishes four newspapers, one each in Amharic, English, Oromiffa and Arabic—respectively, Addis Zemen and Ethiopian Herald, both dailies, and Berissa and Al-alem, both weeklies. Addis Zemen has a circulation of 19,000, the Ethiopian Herald 10,000, Berissa 3,000 and Al-alem 2,500. The Press Agency lacks both the manpower and the transportation capacities to effectively deliver these papers to Addis, the regions and areas outside Ethiopia; for this and other reasons, the papers face major distribution problems. Ethiopia's Constitution grants basic civil liberties to its citizens, including freedom of speech and freedom of the press. However, the legislation governing the press is viewed by many as a hindrance to the development of a free press in Ethiopia. Historically, the Ethiopian government will tolerate freedom of speech to a certain point. But opposition newspapers regularly report dramatic instances of censorship: stories of journalists harassed and imprisoned for reporting truth, etc. The appearance of such stories may, in some cases, have more to do with anti-government hostility on the part of opposition newspapers than with fact—much of these papers' content is based on rumors. A critical use of sources is a rare virtue in Ethiopian journalism of any kind, even though this is basic for developing a trustworthy journalism, and even promoters of human rights in Ethiopia are of the opinion that some journalists are asking for trouble. Journalists have a tendency to distrust open sources, and are more willing to trust what is whispered in the coffee houses. However, these points granted, one must still admit that government oppression of journalists is a reality in Ethiopia as it is throughout the world in fact, Ethiopia once imprisoned more journalists than almost any other country. Privately operating journalists are also hampered by the fact that they are cut off from part of the governmental flow of information. Direct censorship against independent newspapers is rare, but the government, on the other hand, claims that the independent press is irresponsible and un-trustworthy. This is the official reason why journalists from the independent press are denied access to the government press conferences. Thus the situation is aggravated by both sides in the conflict. The recently proclaimed Bill of Broadcasting makes independent FM radio stations legally possible in the country. Such stations could make an important contribution to Ethiopian freedom of speech, but certain civic groups expressed skepticism upon hearing the proclamation draft, citing limitations in the new law. As drafted, the bill does not allow religious organizations and political parties to run their own radio stations. Such prohibitions are regarded by some as a breach of freedom of expression. The Ethiopian Human Rights Council (EHRC) has issued a report on journalists, documenting the arrests and imprisonment of journalists from the independent press. Lately the pressure against journalists seems to have eased a little. There are now fewer arrests, even if journalists still are brought before the courts every now and then. The new tolerance is probably connected to the country's conflict with Eritrea, a conflict on which the government press and the independent press, in general, have had similar views. The question is, will this alliance remain when the conflict is over? It is fair to say that while the makeup of Ethiopia's government has frequently changed during the twentieth century, the printing press's function, as well as that of radio, television, and news agencies, has remained the same: to serve the government in power. Media have consistently and primarily promoted government policy and activities. Consequently, Ethiopia has little or no indigenous tradition of thinking about the press as a free commercial enterprise, or as a watchdog or critic of the government. Because of the continued government control of the broadcast media, the non-government media have been limited to print, but the 1999 proclamation of a new Bill of Broadcasting in the House of Representatives may challenge this government stranglehold. The largest newspapers and the only Ethiopian broadcasting corporation are owned by the government. If one looks at the circulation of the newspapers, the government papers hold the largest share. Non-government papers are hampered by the government's refusal to allow them to send reporters to its press conferences, as well as by an overly suspicious attitude toward the government that sometimes leads to an equally uncritical acceptance of sources critical toward it. To illustrate how strong the tradition of control is, Government radio rarely airs a live interview. Any live interview is considered an advance for free speech. There are disturbingly close relations between the official Ethiopia Journalist Association and the government. This is emphasized by the fact that the head of the association also heads up Ethiopian Broadcasting and the country's official news bureau. There is also an independent journalist association, the Ethiopian Free Press Journalist Association (EFJA). This association is not a legal body in Ethiopia. Apart from these, there are no press institutions/associations in Ethiopia. This lack provides yet another illustration of the two main problems in Ethiopian journalism: its low level of development, and its dominance by the government. At the same time the Ethiopian people show a growing awareness of the importance of the media. Lobbying has increased, and various groups have introduced initiatives to improve Ethiopian media. On September 24th -25th, 1999, the International Press Institute organized a seminar under the theme "Ethiopian Media in Development." "Independent" and "government" journalists gathered under one roof for discussions about the state of their joint enterprise. For one and a half days ethical and other problems afflicting the Ethiopian media were raised and solutions suggested. The seminar was sponsored by the Austrian, British and Norwegian embassies in Addis Ababa. The government views radio as the most important mass medium in a large country like Ethiopia. The leadership in the country's only official school of journalism consider radio and TV to be important assets in promoting democracy in the rural and remote areas of the country. Radio's strategic importance is also, some suspect, the reason behind the government's reluctance to allow private radio stations. Broadcasting, primarily the radio, reaches a much larger part of the population than does print, though Ethiopian radio is limited. Radio Voice of the Gospel, owned by the Lutheran World Federation, operated prior to the overthrow of the Emperor in 1974. Their facilities were seized under the Derg, and today there are only two radio broadcasters in Addis Ababa: Radio Ethiopia and Radio Fana. The latter is associated with EPRDF, but is not directly government owned. There is only one regional radio station in Bahir Dahr, which is associated with the regional government. The other radio station is TPLF radio in Mekele, broadcasting only in Tigrigna. There are some regional broadcasting initiatives surfacing, of which Bahir Dahr probably is the most developed. The regional radio in Bahir Dahr, a major town in the Amhara region, is run by the Department of Culture, Tourism and Information. This region is said to have 15 million inhabitants. The regional broadcast is transmitted one hour per day, seven days a week. In addition, the studios also produce material for national television and publish a weekly newspaper and a quarterly magazine. According to this regional broadcast center, the station covers 90 percent of the region. Nobody knows the actual number of listeners. The first audience research will be conducted next year. As previously noted, the vast majority of newspaper readers live in Ethiopia's capital, and Addis Ababa uses much of the country's other media as well. The numbers are less certain for radio than for print media, but it is believed that a similarly large difference exists between the number of urban radio listeners and rural ones, though this difference is less pronounced than the difference in the corresponding numbers for print media. Radio Ethiopia claims to have reached 50 percent of the landmass and 75 percent of the population with a good signal, making it the most influential news source in the country. However, frequency coverage does not reflect the station's actual availability to listeners, due to a lack of radio receivers. Ordinary audience research is not conducted in Ethiopia. It is too costly and too complicated. But in connection with the field work for this article, a limited audience research was conducted in Addis Ababa (count 1,200), Ambo (count 200), Awassa (count 301), Debre Zeit (count 200) and Nazareth (count 299). The data has to be further analyzed, but it reveals the great potential radio broadcasting holds for Ethiopia. 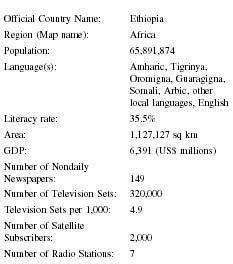 With these facts in mind, the recent proclamation of a Broadcasting Bill by the Ethiopian House of Representatives seems an interesting and perhaps hopeful sign. Part Three of this Proclamation sets out a legal basis on which private commercial radio and television can be licensed. The Bill of Broadcasting may bring the introduction of FM radio closer to reality. This will be an enormous challenge for the media development in Ethiopia. Those few Ethiopians who can watch TV, most of whom live in Addis Ababa, have only one channel's worth of state-controlled programming to watch during their evenings and weekends; during the day only the Educational Mass Media Agency broadcasts. The mushrooming of "independent" papers and the lack of professionalism in the field make it important that basic journalistic education in Ethiopia be improved, both in the long and short terms. Ethiopian media professionals at this point lack some of the basic skills necessary for the press to play a significant role in any democratization process in Ethiopia. From a quick survey of the Ethiopian press, one may safely conclude that the country badly needs education in journalism. Few Ethiopian journalists have professional education in the field. Only a couple of people in all of Ethiopia hold advanced degrees in journalism. Many reporters operate as spokespeople for particular political views, rather than as journalists. Self-censorship is also a big problem, because some journalists would rather maintain peace between themselves and the state and thus avoid reporting any facts that may force ugly confrontations. Among the independent papers, which are under less pressure to show deference to government accounts of events, an equally unprofessional skepticism about the government pervades political reporting. The Mass Media Training Institute (MMTI) in Addis Ababa is the only officially funded institution providing journalism education in Ethiopia. MMTI started in 1996 and runs a two-year program for approximately 100 students. Eighty percent of the students enter the school on recommendation from the government. In principle, the rest of the places are open for all. In year 2000, applicants contested these 20 openings. Most of the teachers have journalistic experience, but not all have a formal education in journalism. Addis Ababa University also offered minor-level courses in journalism. However, plans are underway to establish a School of Journalism at Addis Ababa University. There are also independent institutions in Addis Ababa offering shorter courses in journalism, and a private college (Unity College) is giving courses in journalism. Ethiopia is emerging nearly finished with its first full decade of democracy. Freedom for journalists has not been the normal practice, but signs are hopeful. Recent legislation paves the way for democratic reforms, though these are sure to take on an African frame. Aadland, Öyvind. "Ethiopia Research Report." Gimlekolen Mediasenter, 2001. Azzeze, Keffeyalew, General Manager of Ethiopian Press Agency, Ethiopian Television, Radio Ethiopia and Ethiopian Herald and Chairman of the Ethiopian Journalist Association interview by Öyvind Aadland. Addis Ababa, June 16, 1999. Bisarit Gashawtena, Vice Minister of Information and Culture, interview by Öyvind Aadland. Addis Ababa: Friday, June 18, 1999. Bishaw, Dr. Mekonnen, Secretary General Ethiopian Human Rights Council (EHRC), interview by Öyvind Aadland. Addis Ababa, June 16, 1999. Chemu, Ato Woldemichael, Minister of Information and Culture interview by Öyvind Aadland. Addis Ababa, June 11, 1999. Debelko, Ato Tzehaye, Head of MMTI interview by Öyvind Aadland. Addis Ababa, June 16, 1999. Galla, Shibberu, Director of EECMY, Communication Services, interview by Öyvind Aadland. Hiwot, Alemayhu Gebre, Bureau Head Culture, Tourism and Information Bureau, interview by Öyvind Aadland. Bahir Dahr, June 14, 1999. Negga, Berhanu, General Manager, EMAISC, President of Ethiopian Economic Association and Professor in Economics at Addis Ababa University, interview by Öyvind Aadland. Addis Ababa: June 10, 1999. Hi,I want to say keep it up in all your jobs.Since we are learn more from you. Hi this is a nice, comprehensive summary that I want to refer to for my term paper. I appreciate if you could tell the bibliographic details. Who has published it, when and where. Radio stations/The numbers of FM stations are now 7. Tv 3 and the like. It is well organized and with good information.Such kind of researches are helps our country to improve basic facts. it is better if the media work with the people since it is like mouth for the people.media can control the country more than solder. Hi this is great. I just would like to know when this data was compiled and does it get updated every year? I want to give my opinion on Hawassa University as follows. The Campus leads as a Slave that do not have any right to say.Even if we ask something regardless of the school matter it does not give as any answer rather you can go to another camp and attend. So by this condition how we can learn? the given information should include recent information. can you tell me more about the oral mass communication culture in ethiopia. Every conditions existed in our country are very interesting .I would like to appreciate everyone who has taken on the leading positions.Ok! I THANK ALL OF U.By this chance I request u to send the history of the ethiopian herald newspaper starting from its establishment up to now with its daily publications so that I can write a kind of report for business communication course.10Q! it is all ok. but i want to know your marketing principles through Ethiopian radio for my term paper.and major problems of the radio. really i appreciate it but it is not latest info so i kindly request you please provide me latest information regarding the marketing principles of Ethiopian radio to promote our fabulous tourist attractions. Thank you in advance!!! You did a nice job, really! But, what i would like to remined you is that it will be very nice if you keep on updating it. please add the history of amhara mass media agency. I would like to appreciate for your comprehensive summary, It is with a good information. Bay the way I am an Ethiopian and studying my M.A. in communication at Daystar University in Kenya.If you are volunteer I am interested to interchange concerning resent information of Ethiopian mass media freedom it helpful to my study here.would you help me how can I get some reference books please? Finally may I say some thing? did you have an information as there are more TV & Radio? for instance, ( Awassa south Ethiopia,Nazeret Oromiya etc.)? what u have done still today is good but there are many things that u focus on is that the quality of the program and also think for rural population the way they gate information too. First I would like to apreciate your short, precise and accurate word usage what you like to blog. And your blog give me good information to me to do my senior essay of 2004 gratute class, so thank you very much keep it up i love you so much for your voratious work my name is tadesse from Bahir dar university. this article is very intersting for the main problem of the ethiopian reporter specaly gevernment reporters. so all reporters and editors to work based on the ethics. I have read all with a great appreciation, keep with update information please. It is very difficult to get the background information about E TV's programs,their aims,contributions,please,try to make the access of information simple, so that we can communicate together! Even if it is not updated, my problem is, not knowing when it is published, who r the writer? please try to specify it,to make this as a source. it is really interesting that inspires us to do so! In Ethiopia over 80 ethnic groups exist. One ethnic group imposed its language, religion, history, tradition, even names on the rest over 140 years. But like elsewhere assimilation by force and by will did not work. The practice of unitary system of government has been preaching uniformity of one nation, one language, one history, one ethnic group song, even forcing indirectly to use one ethnic groups naming of places, individuals, etc. That did not work. Fortunately, Ethiopians have not used English as a unifying language of regions. This decision was good than some of the African countries that adopted English as a unifying language of regions. At the same time, attempt of adopting one language over the other ethnic group language has no doubt suppressed the others dwarfing or eliminating the growth of other languages, religions, values, etc. This also made certain ethnic group/s to monopolize the administration, justice, and wealth of the country and led to despising and see one another with contempt particularly in urban setting (offices, employment, universities, and where common services are shared). This picture has been changed since 1991 when EPRDF acknowledged accepted "Unity in Diversity". Now different ethnic groups using their mother tongue. This was good for many but bad for those who have been the beneficiaries for one and a half century. Within the last 23 years of EPRDF, we have experienced good and bad impact of using diverse language. The good thing is Ethiopia has saved its languages from extinction. The bad impact is that EPRDF is too stubborn to study and make corrections in its effort. What made it stubborn is partly the media whose authors come from the old beneficiary elites that advocate one unity system of Govt. They are resistant to change although they have finished their times. They do not see diversity positively in fear of more dividing than uniting. Hereafter, we cannot re-introduce unitary system, because it is already out of hand. Hereafter, intercultural dialogue is a necessary for the cohesion of Ethiopia. Instead of using one official language, it may also be useful to use more than one official language to promote intercultural understanding. it's very interesting to have such beautiful intercultural diversity. but we have to do more on different kind of language in our country. till we are multicultural society it should be broad than what we are looking on language, culture, social, religion and so on. farther more the way domestic citizens can get newspaper on mobile by payment of money from his/ her mobile account. please try to build such systems in order to get different newspaper on our mobile form our mobile account. thank you. would u mind telling me haw civic and ethical education started inEthiopia? Hi how are you ? i got very essential information about Ethiopian media thank you.